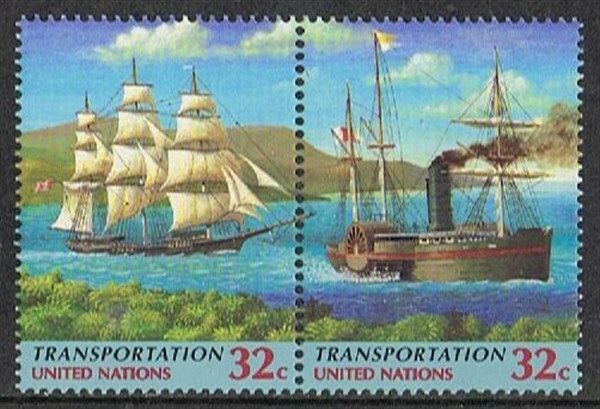 United Nations, New York issued in 1997 a set of stamps for “transportation” this two stamp shows us. The sailing vessels is a clipper, square rigged with skysails and on the mizzen mast a spanker sail. The other stamp shows us a side paddle steamer, square rigged on the foremast and the other two masts, schooner rigged. Wikipedia has on sidewheelers: Sidewheelers are used as riverboats and as coastal craft. Though the side wheels and enclosing sponsons make them wider than sternwheelers, they may be more maneuverable, since they can sometimes move the paddles at different speeds, and even in opposite directions. This extra maneuverability makes sidewheelers popular on the narrower, winding rivers of the Murray-Darling system in Australia, where a number still operate.